Сrisis can be a fruitful time for innovation. In Kenya for example, the 2007-08 post-election crisis [en] led to the creation of the Ushahidi [en] mapping platform. In Russia, post-election protests have given birth to dozens of new web platforms and mobile applications. In most cases, innovations are created by the oppressed (in Russia's case, the opposition), who try to challenge the existing balance of power by using new tools and technologies. But the state can also adapt and adopt some of these technologies, in order to protect the status quo. In Russia, the accelerated innovation process has been going on for the past three months, following the initial post-election protests [en] in December 2011 (some applications published now, however, had been planned and developed earlier). Innovation can be seen not only in the new tools, but also in the new forms of protest enabled by the technology. In the analysis of the crucial change, two important factors should be taken into consideration. Firstly, for many years, the dominant online political sphere in Russia has been LiveJournal, a platform that is used primarily as a space for content publication. During the past year, many people started using Facebook, an environment facilitating much more active sharing and interaction. According to the recent statistics from WCIOM, the percentage of Facebook users among Internet users in Russia has increased from 5 percent in 2010 to 18 percent in 2012. 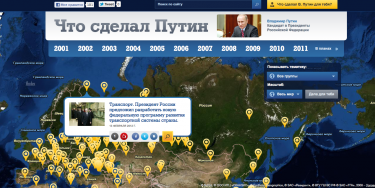 This has made the Russian online public sphere even more dynamic and interactive. Secondly, there has been an increase in brand new tools and platforms compared to the earlier usage of the existing solutions. These observations suggest that either there has been an increase in information literacy of civil activists, or an increase in political awareness among those who have these skills due to their professional activity. Of course, there is also a commercial explanation: IT teams are interested in developing attention-grabbing social projects. One of the most challenging issues for the opposition anywhere is coordination of activities between different factions and groups. The website of the “League of Voters” is a coordination hub for all opposition activities, which is not affiliated with any particular party. Moreover, it provides a tool that helps to find groups working on particular issues in the same region. It has more than 250 regional groups (anyone can add his/her own group). It has also provided a tool that allows one to become a volunteer in a particular area of oppositional activity. Another website that was created as a non-political news portal of the protest movement is mitinginfo.ru. The major role of the Internet, however, went far beyond this. Online space started to be a source of creation, production and distribution of leaflets and protest posters. The most advanced platform where people can share, find, and produce posters is rosagit.info. Additionally, a special “Street Art” group on Facebook was actively used not only for the creation of new posters, but also for online proliferation of leaflets. These are examples of how Internet tools have made the online space a factory for production of collective politically-engaged symbols. Facebook, Twitter, Vkontakte, LiveJournal and other popular platforms are being actively used for mobilization of people for protest rallies. Due to legal requirements, however, the organization of a big protest event needs to be approved by the local authorities and police. One of the protest types that was enabled by the Internet is the car-based protest. A few times, social networks and blogs were used to organize large-scale flashmob protests in many cities, during which people with white ribbons on their cars gathered at a specific time and location. Some of the protests attracted more than a thousand cars. The same type of action was later adopted by pro-Kremlin movements. 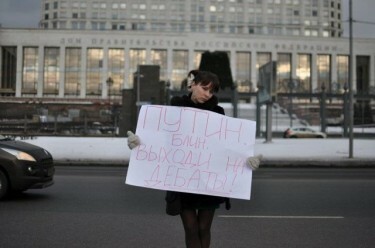 Olesya Shmagun's one-person protest. Photo by Pavel Hitzkoy, used with permission. On the other hand, according to the Russian law, a protest by one person does not require special permission. A good example of how it can be used and amplified by ICT was provided by Olesya Shmagun. She made a poster that read, “Putin, go out and take part in public debates!” – and stood with it by the entrance to Vladimir Putin's office. She was questioned by the police and the government's security service, but wasn't detained because one person protests are not prohibited. Later, she published the story of her protests and a few photos that were taken by her friend on her LiveJournal blog. Just a few dozen people were able to see Olesya’s protest in the offline world, but the blog post drew attention of many more, and was shared by many blogs and media outlets. This story shows the power of what is known as Manuel Castells’ “mass self-communication” [en]. Thanks to the presence of one camera, an offline one-person protest found a way to a wide audience online. A major challenge for the Russian opposition, however, was to find a way to turn a one person protest into a massive one. The idea behind the Big White Circle action [en] was to cover the circular road around Moscow's center (known as the Garden Ring) with one-person protests. Unlike the previous large protests, this one did not receive a permit from the authorities. Moreover, this type of action was more of a big flashmob [en] rather than a traditional rally, which made it very difficult to deal with from the point of view of the police. ICT makes it possible to organize new types of protests, which have no clear leader, are decentralized, can bypass some legal restrictions and create new challenges for the authorities. To help organize the Big White Circle protest, a special online tool was developed for the first time for coordination of a single specific protest of a unique nature. Feb26.ru allowed people to check in at locations of their choice on the map of the Garden Ring circle, and showed what locations were already occupied. Unlike other protests, the Big White Circle did not have any organizational committee or a particular leader. The role of the leader was played by a website. The website suffered from DDoS attacks; as a result, it was closed and deleted by the provider; a day later, it was restored. The practice of creating special dedicated websites for specific protest events is one of the most interesting innovations of the Russian protests. The initial idea belongs to Ilya Klishin, who launched the dec24.ru website (which doesn't exist anymore) for the big opposition rally that took place in Moscow on December 24, 2011. One of the most significant success stories is that of Karta Narusheniy (Map of Violations), a crowdsourcing platform for election monitoring. One of the major challenges of the crowdsourcing system is the credibility of information and the limited capacity to verify it. A special platform Svodny Protocol was created for the collection and analysis of the election observers’ reports and protocols. The system presents the idea of “bounded crowdsourcing” [en], when collection of information is based on a limited number of contributors who have special access to the event of interest and whose identity has been verified. Another platform with a similar purpose was developed by the NGO Golos, a service called SMS Golos, which allows to collect reports from observers through text messages and maps the voting results in real time. Not only the independent media, but also the Russian government decided to create an online system for election monitoring. Following an order from Putin, the state communication company Rostelecom developed a website webvybory2012.ru, which allowed people to follow the majority of the Russian polling stations (some 95,000) online on the day of the March 4 presidential election. Every polling station was equipped with two cameras: one has to be focused on the ballot box and the other has to give the general picture of the polling station. Once the voting was over, one of the cameras broadcasted the counting of the votes. The cost of this project is at least 13 billion rubles (around $500 million). Many bloggers have criticized this system, claiming that it creates an imitation of transparency, when actually the most common election violations cannot be monitored through webcameras (more detailed analysis can be found here [en]). Despite this, the cameras allowed to spot numerous violations (1, 2) [en]. Ilya Segalovich, one of the founders of Yandex search engine, suggested a solution that could significantly increase the capacity of the webcam system to contribute to the real election monitoring. According to him, it should be a monitoring system based on a network of webcams and a network of citizens’ mobile phones. The two networks of sensors have different capacities to follow different type of violations, therefore collaboration and synergy are required. Obviously, the government has not responded to this proposal, but a group of activists has developed a special election monitoring application for smartphones. The application Webnablyudatel has a classification of all the violations and makes it possible to instantly share video, photos and reports of violations. One week before the election, Russian developers introduced Grakon, a special social networking platform for election monitoring. The purpose of this platform is to make election monitoring and coordination between various groups of observers as simple as possible. The platform helps people join a social network as voters, observers, members of voting commissions, lawyers, and representatives of the authorities. To conclude, we can see that a new election monitoring eco-system has been created, which serves as a powerful and real-time alternative to official sources. In Russia's case, the law allows any citizen to be an official observer on behalf of any party/presidential candidate taking part in the election. Observers played a very significant role in exposing violations and sharing them online during the December 2011 Duma elections. As a result, a few platforms were created to make it possible for everyone to become an observer. One such platform that aims at simplifying the procedure of becoming an observer is Alexey Navalny‘s [en] initiative called Rosvybory.org. A similar function is offered by the project Citizen-observer. There are also some regional websites whose goal is to increase the number of local observers. In St. Petersburg, a special website called Saint Petersburg Observers was launched by a group of local activists. The Russian protests have demonstrated a few innovative methods of coverage of the rallies, which addressed some specific challenges. The first challenge was the permanent debate about the number of the protesters: organizers of the rallies tend to claim high numbers, while the authorities tend to claim low numbers. One of the methods of obtaining reliable results was using photos taken from the drones (Patrick Meier wrote about it [en] recently). Another method was to create 360-degree 3D photo installations that allow the viewer to see the entire crowd. The second challenge was a lack of live coverage of the protests in the electronic media. A mobile phone livestream technology (based on Ustream.tv) was actively used to cover the protests. It enabled live broadcasting from such unusual locations as a police car and a police station (broadcast by the protesters who were detained). It should also be mentioned that citizen-based journalism played a very important role in increasing transparency of the coverage of pro-government rallies. Internet users were able to provide much content, including high quality YouTube reports that showed that many of those who took a part in these rallies had been forced or paid to participate, without really having any political stance (an example of a pro-government rally in St. Petersburg is here). In the Russian political environment, many citizens have lost trust not only in the government, but also in the opposition politicians. One of the major challenges for organization of the protests was to get the potential protesters trust the organizers. As a response, the key discussions about the organization of the protests were broadcast on a new online channel Networked Public TV (SOTV), which was launched in November 2011. SOTV was created as a public television channel by a number of liberal journalists and public opinion leaders. Another popular Internet-based channel Dozhd (Rain TV) also played a significant role during the protests. Another tool that has helped to increase trust and transparency of the organization of the protests is the online voting that was used as a tool for selection of the rally speakers. In this case, Internet users could vote on SurveyMonkey or on Facebook and in this way participate in shaping protest agenda. One of the most significant online struggles during the Russian election campaign was caused by the hacked private e-mail exchanges and other private data of both the oppositional and pro-Kremlin activists. The first “victim” in this struggle was Alexey Navalny's private e-mail [en] account. Previously, private accounts of his supporters were also leaked [en]. As a response, a group of hackers claiming to be a part of the international network Anonymous published e-mail exchanges of a number of pro-Kremlin activists andthe members of the presidential administration. The contents of the mailboxes were published on a special website slivmail.com. A number of different platforms was organized around this major repository of the leaks(e.g. Rumol Leaks community, and Vkontakte group). Any protest involves many risks, and in many cases immediate help may be needed. In Russia's case, one of the major issues has been legal help to people who were detained by the police. Helpwall.info allowed coordination of real-time assistance during the rallies. It made possible to post requests for help via text messages, Twitter and Facebook. At the same time, the tool had a relatively limited success. It appears that real-time communication at protest venues and organization of real-time help still remain the challenges that need to be addressed. A service Kuda-Komu, which allows to generate a complaint letter to any Russian authority, opened a special page devoted to the elections. The service helped to create letters that focused on particular types of fraud and suggested where they should be sent. A dedicated website was also used for holding accountable those officials who were involved in falsification of the elections. A website chernyspisok.info (The Black List) allows any citizen to submit information about the people who might have been involved in election fraud. A project similar to the Black List is Rosmafia. Another project, churovu.net, focuses on the Head of the Russian Central Election Committee, Vladimir Churov, who is seen by many as the person responsible for falsifications. The site’s main goal is to collect signatures in an online petition that calls for Churov’s resignation. Surprisingly, one of the areas that has seen little innovation during the elections is promotion of political candidates. Most of the forces affiliated with political parties are using the same tools. An interesting attempt to make a crowdsourcing platform for support of a presidential candidate was made by Putin’s supporters. “What Putin has done” is based on a map of Russia where anyone can submit information about Putin’s good deeds. Another Internet-based innovation that used Putin's image actually caused anger in the presidential adminstration. Budilnikputina.ru (Putin's Alarm Clock) offered a unique service: it made possible to order online wake-up calls for your friends that used Putin's voice. The service was free-of-charge. Putin's spokesman Dmitry Peskov denied any links to this service, and Putin's chief of elections staff Stanislav Govorukhin called it a “provocation that was organized by the protesters.” Putin's Alarm Clock service was also blocked for a few hours due to a DDoS attack. Screenshot of "What Putin has done"
On the opposition's side, an interesting example was provided by a young activist Vera Kichanova (later elected as one of the first blogger deputies), who used QR codes on posters that promoted her candidacy for the local elections. Another citizen initiative for the local elections in Moscow is the platform Gorod2012, which makes it possible to see all the candidates who are not affiliated with the ruling United Russia party. There is one additional online activity that should be mentioned. It is not very innovative itself, but it is essential for enabling innovation: crowdfunding, webmoney and tools for donating micro payments online. Once the online transfer of small amounts of money becomes easier and more reliable, it will have a significant impact on innovation. People who do not have enough skills to create new platforms now have more opportunities to support those who can. Many of the platforms that were mentioned above were supported by the Internet users. Crowdfunding was actively used to support the organization of protests offline. If you would like to contribute to the list of innovative tools and platforms that have been developed within the context of the Russian elections, please leave a comment to this text. Thumbnail and featured image of Russia election protest by Flickr user Gregory Asmolov (CC BY-NC 2.0). This is is absolutely *brilliant*. Thanks for writing up such an excellent piece. Truly stellar. Rock on. I agree with Patrick – this article is outstanding and deserves wider publication. Could be used in a classroom. Important for anyone interested in the role of new media in social change.